How to make homemade candles. Making your own candles at home can be an inexpensive, enjoyable way to spend a day with your family. The art of candle making offers many options and you’re only limited by your imagination. 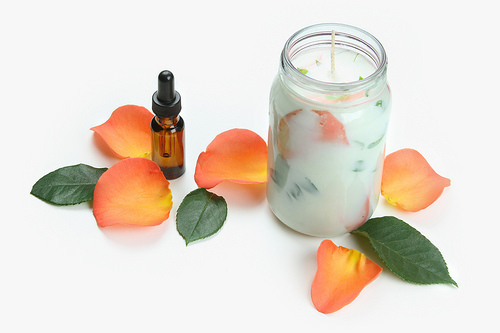 WHAT YOU’LL NEED: Although there are literally hundreds of products you can purchase to make a wide variety of candles styles, we’ll begin with a basic candle, and you can build your expertise from there. 1. WAX: A good, general all-purpose wax is plain old Paraffin Wax, often found in the canning section of your local grocery store and also available in craft and hardware stores. 2. SCENT: Herbs, cooking ingredients like Peppermint and Vanilla and spices work well. 3. COLOR: Food coloring, inks or dyes. 4. WICK: You’ll need something to insert into the candle that will allow it to burn. You can purchase wicks from any craft store or make your own by dipping cords or heavy string into warm wax and allowing to dry on a sheet of wax paper. 5. MOLD: This is what you will pour the hot wax into. Do you want your candle to be free standing or sit in a decorative container? Cans, glass and hard plastics work great for simple molds. 6. WAX CARRIER: A wax carrier is what you will use to heat the wax in as it melts. A double boiler is excellent, but you can use a saucepan filled with water as an alternative, placing the actual wax into an old coffee tin and then into the water for heating. 7. ADDITIVES: Though not necessary, you can add things to your wax for decorative purposes. Leaves, herbs, plastics and even jewelry can add pizzazz to your creation. 8. THERMOMETER: A candy thermometer will be fine. 9. MOLD RELEASE: You’ll need this to ensure that you can safely remove the hard wax from your mold without damaging your candle. Silicone spray, peanut oil or cooking spray oil will all work. 10. PENCILS/DOWELS: You’ll need one of these for each candle you’re constructing as a wick holder. 11. WOODEN SPOON: For stirring wax. 12. WICK CUTTER: Scissors work great. Once you have your supplies in order, create a working space that will allow you to heat and transport warm or hot wax without too much difficulty. It’s good to clear off a fairly large amount of counter or table space so that your containers and candles can sit freely, without fear of tipping or being knocked over. 2. Always use a double boiler or the coffee cup in a can method to heat wax. Never place wax directly into a saucepan or heating device on it’s own. 4. Never overheat wax. Fumes from overheated wax can cause severe illness. material, it’s time to make your candle. 2. As the wax is in the beginning stages of melting, spray the inside of your molds with peanut oil, cooking spray or silicone spray and set them aside in an area where it’s safe to pour the wax. 4. Once the wax has completely melted, you can add to it anything that you’d like. This is the proper time to add scents (a little goes a long way! No more than one teaspoon of oil or herbs is usually necessary.) and coloring. Gently stir the wax for a few moments, allowing the color to blend and the scent to mix. 6. As your wax is hardening, get your wicks, tying one end to the middle of a pencil. Slowly drop the free end of the wick into the wax, and rest the pencil on top of the mold. This will prevent your wick from falling into the wax as it’s hardening. It will take several hours for your wax to harden to the proper consistency. Many experts recommend allowing your wax to harden overnight before attempting to remove your candles from their molds, but this may not always be necessary, depending on the size of your candle. Once the wax has hardened, you should be able to tip your mold upside down, allowing your new candle to slide out freely. You can add decorations such as ribbons or flowers to the outside of your candle for gift giving, or place it in a decorative tray or box. Remember, you’re only limited by your imagination! We Supply all the Materials that you need to start up your own candle making business. From Paraffin wax, wax additives, and other candle raw materials… candle wick, anchor, glass containers, coloring, scents, molds, machines, etc. just give us a call at # 09278792029 / 09193188318. You can also call us at (02)584-4525 / (046) 489-8609. or visit us at 139 Buhay na Tubig, Imus, Cavite. We Are open from Mon – Fri 8am-5pm. Look for Jan or Bernadette.